Not stock, but interesting just the same. The brochure cover trumpeted its virtues: “Balanced Beauty! Fine Performance! Greater Safety! 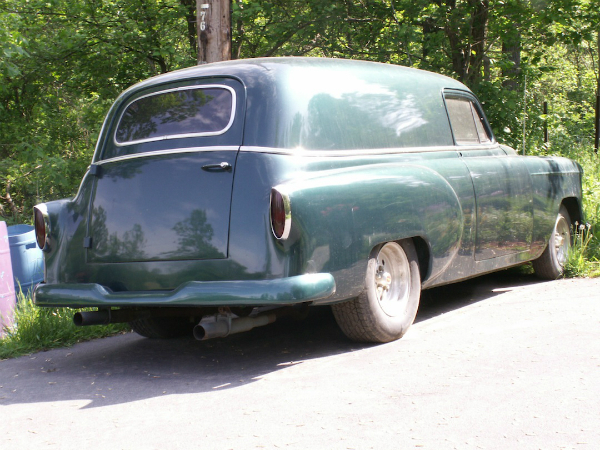 The Chevrolet Sedan Delivery for 1954 Establishes Prestige for Any Business.” This was the perfect vehicle for the small business which needed to carry stuff, but not that much stuff. They were basically two-door station wagons with no rear seating areas, no rear side glass, and a side-opening tailgate for easier access to the cargo area. We found this one a couple of summers ago while driving through the Tuscarora Nation in Niagara County. Jim Corbran, RRofWNY …and check out our Facebook page: Un-American Classic Cars The post RealRides Of WNY appeared first on Buffalo Cars.